Randomization is a fundamental requirement of clinical trials. In recent years the demand for more randomized clinical trials has increased in many areas of clinical research. Randomization is important for several reasons but most importantly it ensures treatment group balance, eliminates selection bias and limits the predictability of treatment allocation. Another critical requirement is trial supply management. The planning, manufacturing and distribution of clinical supplies can be complex due to a number of factors. However, at the end of the day, clinical trial supply management must ensure that the right medical supplies are delivered to the right patient at the right time, every time. Ennov RTSM is a comprehensive solution that manages randomization and clinical trial supplies. An integrated IWRS (Interactive Web Response System) allows clinical investigators and site personnel to access study data from any location at any time and execute their study-specific activities using an intuitive web-based interface. Ennov RTSM allow statisticians to define complex randomization schemes and supports patient randomization using standard algorithms such as minimization and stratification (variable lists). Ennov RTSM supports virtually all study types including blinded studies, double blinded studies, multi-arm, and multi-arm multi-stage studies. Patient randomization by the clinical investigator is performed quickly and easily by connecting to Ennov EDC via a web browser. Ennov RTSM is also used to manage the IMP (investigational medicinal product) from the initial shipment to the investigating centers to dispensing and replenishment. E-mail alerts on the IMP stock status provide site coordinators with complete transparency into their on-site inventories and automatic replenishment keeps their studies running smoothly and without disruption. Randomization and capturing clinical data go hand-in-hand, which is why the Ennov RTSM connects directly to Ennov EDC. When conducting an EDC study, the investigator can allocate the treatment (either placebo or IMP) to a patient according to a randomization list or via a minimization algorithm. Using a web browser, The investigator connects to Ennov EDC to add a patient to the clinical trial. After entering the patient eligibility criteria and other parameters required for stratification, the investigator requests the randomization for the patient. Data managers can easily define the randomization scenarios with Ennov RTSM. 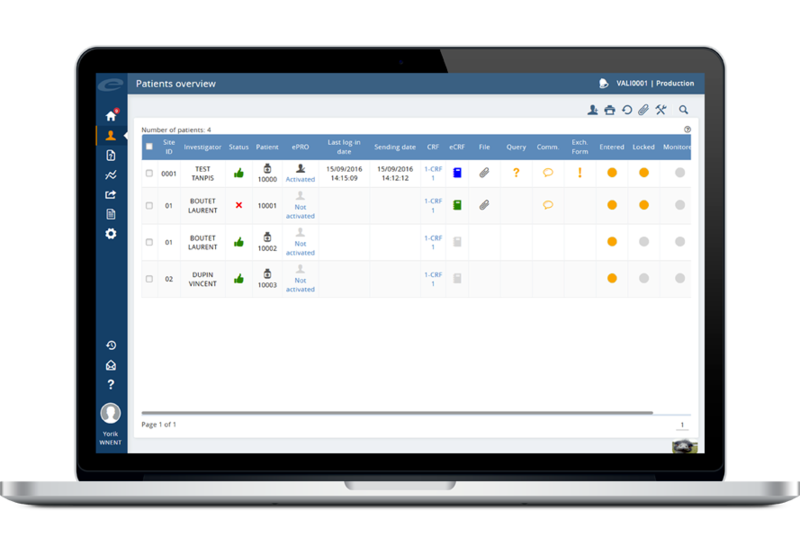 Many configurable options are available including the choice of which page the investigator will request randomization, blindness management, choice of strata, type of randomization, option “random factor”, and option “X random patients”. Ennov RTSM allows you to directly display the result of randomization in the eCRF such as the treatment arm or any references to the experimental drugs that need to be given to a patient. Very high customer satisfaction, 98.5% of projects delivered on time and within budget.